Our motorcycle speakers and kits are made with water-resistant and weather-resistant materials to ensure durability against the harsh outdoor environment conditions, such as rain, moisture, and damaging sun rays. 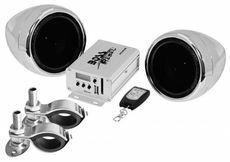 Enjoy your musical tunes with great sound in your motorcycle while out on the open road with our wide variety of motorcycle speakers. We also have kits that are vehicle specific as well as speaker kits that include a motorcycle amplifier or a stereo. Motorcycle speakers and speaker sets such as pods are built with materials that are water, fog, salt, and UV ray resistant. These durable speakers prevent rust and overall wear and tear. The outstanding durability of the motorcycle audio line allows you to enjoy your favorite music throughout every outdoor adventure. Our motorcycle speakers are available in a wide variety of sizes, colors, and styles. Browse now to find the speakers that fit your motorcycle. Also shop top brands such as Kicker, Bazooka, and Kenwood.